This harness is a phenomenal product to attach to your dog. The harness is made of braided nylon which is ca 5 cm wide and very strong. You attach the harness using a buckle with three connection points, a so called “cop lock”. The harness size is adjustable based on chest size. The harness is used by police forces in the US, among others. Define the size of your dog. You must measure the circumference of the widest point of your dog around the chest and ribcage. 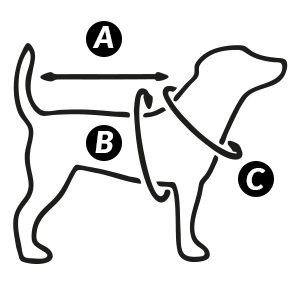 The measurements of the harness are based on the circumference of the dog which may vary significantly between breeds and sizes. Stand over your dog and use a measuring tape around the widest part of the dog’s chest area. Measure to get the correct size needed for your dog. If the measurement falls between two different sizes you should order the larger one.